The Baseball Hall Of Fame is one of the most debated subjects in sports. To gain entry, you must get 75% of the vote from baseball writers within 20 years of retiring (within 15 years of becoming eligible for the Hall). And, in each year of voting, you must garner at least 5% of the vote. Simple, right? This year’s entrant, Bert Blyleven, took 14 years to get enough votes, one year short of the max. We can use his voting trajectory to determine who else will make the hall in coming years. 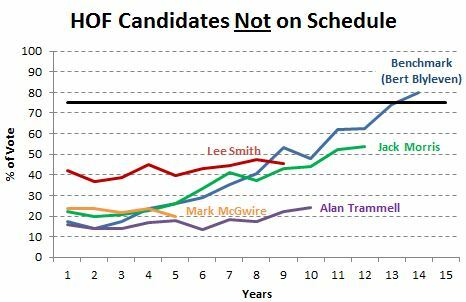 Methodology: I looked at the HOF voting over the past 15 years and plotted each player’s vote tallies year-by-year since they became eligible. I then compared them to Blyleven, who I consider an almost perfect benchmark because of his 14-year journey to the HOF. I would consider each candidate that is behind Blyleven’s pace as less likely to make the Hall, and each one ahead of his pace to be more likely to make it. 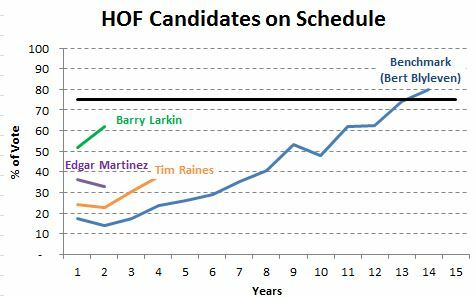 There are three candidates that have been eligible for at least two years that are ahead of Blyleven’s pace: Barry Larkin, Edgar Martinez, and Tim Raines. Are they guaranteed to make it? Not necessarily. Blyleven’s curve is somewhat back-loaded. He gained momentum as the years progressed. Some say Blyleven benefited from a philosophical shift among baseball writers to weigh sabermatrics more heavily than traditional statistics. This was recently evident in Felix Hernandez winning the AL Cy Young award with a mediocre record: 13-12 but tremendous sabermatics stats (the result was called correctly here). Larkin looks like a shoe-in to make it over the next few years. Martinez’s chances look favorable, given his dominance at DH. Raines’s pace is a little surprising, so time will tell if he can continue building momentum. Several players are falling behind Blyleven’s pace and are now looking less likely to make it into the Hall Of Fame: Jack Morris, Alan Trammell, Lee Smith, and Mark McGwire. Lee Smith and Jack Morris are not too far behind the pace and could catch up. One thing about the Hall Of Fame is that they like to have at least one new entrant every year. If Jack Morris or Lee Smith are the closest to 75% in a down year, that could punch their ticket. For Mark McGwire and Alan Trammell, things don’t look good. What does the future hold for first-year eligible players? However, the rule requiring players to garner 5% of the vote to remain eligible also affects voting. 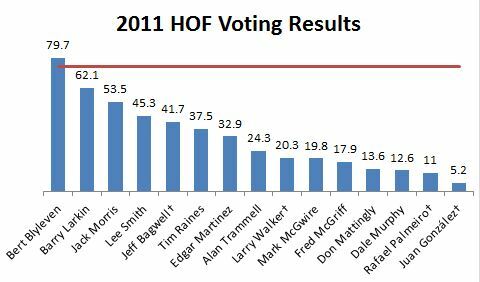 Many players experienced a decline in voting percentage in year 2 (Blyleven, Morris, Smith, Raines, Martinez, and Trammell). As for this year’s newbies, Jeff Bagwell is sitting pretty, Larry Walker is in decent shape, and Rafael Palmeiro and Juan Gonzalez need help. 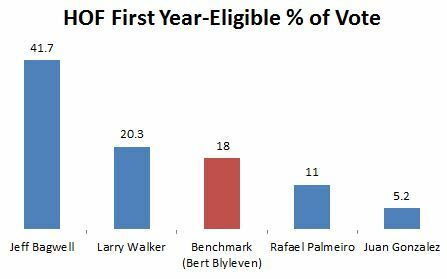 Bagwell’s first year vote of 42% is strong. Walker’s 20% is ahead of Blyleven, but he will need a boost in out years. Morris started out similarly, with 22%, but is now behind Blyleven. As for Palmeiro and Gonzalez, two power bats from the steroids era, their chances don’t look good. They need another philosophical shift, one where home runs are remembered fondly in the post-steroids era, to have a shot. Is Google Reader being phased-out?